Free-standing lace is not just for lace bowls! My youngest DD bought a dress for a swing dance ... a lovely dusty rose, single knit dress that swishes so nicely. The only drawback was that the back was a *very* low "V" and her back bra strap showed. Tacky, tacky, tacky. She figured she could just pin the bra strap to the back of the dress; I knew the dress would be pulled up by the tension. But, what do I know? I'm just the Mom. It wasn't until I actually *pinned* the bra strap to the dress and she could *see* how awful that looked that she realized pinning was not a viable solution. Neither was wearing the low-back bra she already owned ... it has a strap that circles the waistline to enable the back to be completely bare .. but she doesn't like the way that it feels. Ah well ... such is life. But ... I'm not the Mom for nothing. Moms are really good at thinking of creative solutions. I suggested that I could machine embroider some lace thing to use as an insert at the low "V" which would cover up the bra strap. DD agreed to the idea, in principle. I waded through my collection of designs, coming up with several that could work. DD ultimately picked a very interesting choice ... it was a panel for the side of a free-standing lace bowl! The shape of the panel fit the shape of the back of the "V" perfectly and came up far enough to hide the bra strap. I found some thread that *exactly* matched the color of the dress; it was as though the thread had used the same dye as the dress. I used silk organza as the base fabric to provide a foundation for the motif and Floriani's "Wet-n-Gone" as my water soluable stabilizer. The first stitch out showed that the rose in the center of the design was very, very dense ... it made stitching very difficult and created rat's nests on the underside. I used Embird to isolate and remove the underlayment for the rose. The second stitch out was perfect. 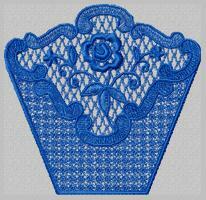 The embroidery design is a free design from Eddy Designs. Click on the "Free designs" link, then at the bottom of that page, click on "Lace Designs". At the bottom of the Lace Design page 1 is the panel I used (it's shown in turquoise).